Thule Roof Mounted cycle carriers fit onto vehicle roof racks. Roof rack mounted cycle carriers are ideal for transporting 1 or more bikes and in combination with other cargo such as kayaks and roof boxes. 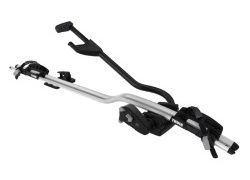 The Thule range offers the best cycle carrier solutions which are safe, secure and easy to use. Upright and Fork Mounted options available. These cycle carriers are available from stock all year round - fast mail order delivery available or visit our showroom and collect. 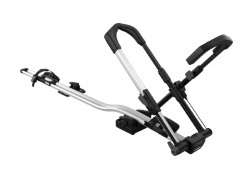 Safe and functional roof mounted cycle carrier at a price that doesn't break the bank! Available individually or as a twin-pack. A roof mounted cycle carrier for quick and convienient bike mounting on your roof. A torque limiter on the frame clamp and diagonal wheel straps offer strong and secure bike carrying for bikes up to 20kg. Aluminium and Black colour options available. 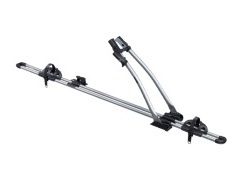 A universal roof mounted cycle carrier with no frame contact. Fast and secure bike carrying with maximum frame protection!  The best option for carbon frame bikes. 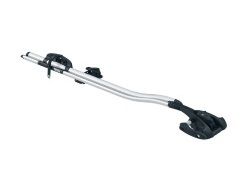 Thule's sleek, light and convienient fork mount bike carrier for the professional look and feel.